Vor circa einem Jahr habe ich euch schon einmal einige Tipps zur Reiseplanung, vorallem New York betreffend gegeben. Damals habe ich von "stillen" Lesern viele Mails bekommen, wie hilfreich und interessant sie den Post fanden und gerne mehr in die Richtung sehen würden. Deshalb möchte ich euch heute meine Liste zeigen, die ich vor jeder Reise durchgehe um sicherzugehen, dass alles vollständig geplant ist und ich alles dabei habe. In der Zeit des Studiums ist für mich Reisen ein sehr großer Punkt, da ich in diesem Umfang nie wieder so viel freie Zeit in meinem Leben habe um die Welt zu entdecken, und hier ist es es mir auch Wert jeden übrigen Euro zur Seite zu legen um möglich viel von meiner Reise-Wunschliste zu entdecken. Ich hoffe euch gefallen meine Tipps! Was ist die Landessprache und bin ich fähig dort zu kommunizieren? Natürlich ist Englisch die Weltsprache, aber ein paar Worte in der Landessprache, wie Hallo, Danke, Entschuldigung, Wo ist der nächste Arzt?,... sind immer hilfreich (vorallem in Frankreich). Außerdem ist es so viel einfacher sich mit Einheimischen zu verständigen und so tolle Insider Tipps zu bekommen - ob ihr fließend sprecht oder nur Bruchstücke ist dabei egal, der Wille zählt. Ist der Transfer zum Flughafen organisiert? Wenn ihr keinen Papa habt der euch freiwillig zum Flughafen düst oder ihr nicht mit öffentlichen Verkehrsmittel fahren könnt, organisiert rechtzeitig ein Parkplatz (im Flughafen Parkhaus ist so ziemlich die teuerste Idee). Oft gibt es Park&Ride Plätze oder bewachte Parkplätze mit Shuttlebus zum Flughafen im Umfeld. Ist der Transfer vom Flughafen organisiert? Falls nein oder falls ihr einen Mietwagen braucht, kümmert euch rechtzeitig darum. Im Internet gibt es viele Vergleichsportale für Mietwägen und beim frühen Buchen spart ihr euch oft Geld. Was möchte ich auf jeden Fall sehen? Gibt es Museen, ... für die man billigere Tickets online kaufen kann? Für interessante Sightseeing Tipps recherchiere ich immer selbst im Internet bevorzugt auf Blogs. Ich kann es euch nur empfehlen unter euren Lesezeichen im Explorer einen Reiseordner anzulegen: Ich speichere mir hierunter jeden interessanten Travel-Blogpost,... ab und hab somit immer zu jedem Ort einige Tipps bereit. Viele Airlines bieten ihn an und ohne geht mittlerweile bei mir nicht mehr. Es ist nicht nur viel bequemer, da der Zeitstress beim Check in am Flughafen ausbleibt, sondern ihr habt auch bereits z.B. 24h vor Abflug sicher einen Sitzplatz - es kann ja immer sein, dass der Flug überbucht ist. Für die Tickets gilt doppelt hält besser: Ich habe meine Tickets immer in der iPhone Passbook App, was super beim Boarding klappt, aber zur Sicherheit sende ich sie mir auch per Mail/drucke sie aus. 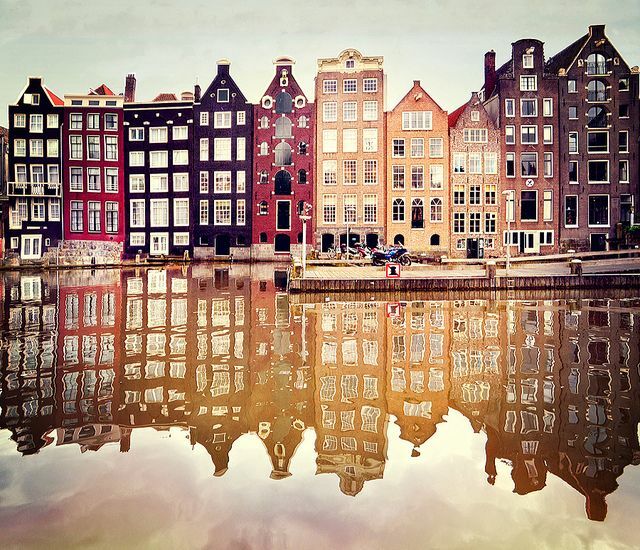 Today I want to show you my personal ideas to make travel easier with my personal list, which I check before every travel to be sure that everything is completely planned and I have all the necessary stuff with me. How much money do I need - for the staying, the flight and last but not least for the living costs like food, drinks and special activities? Do I already have enough money saved? Or if not how can I save it? I have a saving account for my travels to which I transfer money at the beginning of every month. Therefore, I'm also prepared for last minute trips. Whats the language in the country? Am I able to communicate there? Of course we're all aware of the world language English, but I think it's very important to speak at least some common words in the local language. It's way more easier to connect with locals and get great insider tips, if you can make some small talk with them. You don't have to know much, but the words like Hello, How are you, Thank you, Sorry, Where is the next hospital are a must. And don't be scared if you don't speak fluent, the locals will appreciate also if you TRY to communicate! Is the transfer from the airport to your stay already planned? If not or if you need a car for exploring, try to research and book early a car rental. There a many sites in the internet to compare different car rentals, and often they're cheaper if you book early. For the states I recommend you RelayRides. What do I want to see no matter what comes? Is it cheaper to buy tickets online for museums or other sights? I always research on local blogs or travel blogs for interesting sightseeing and restaurant tips. 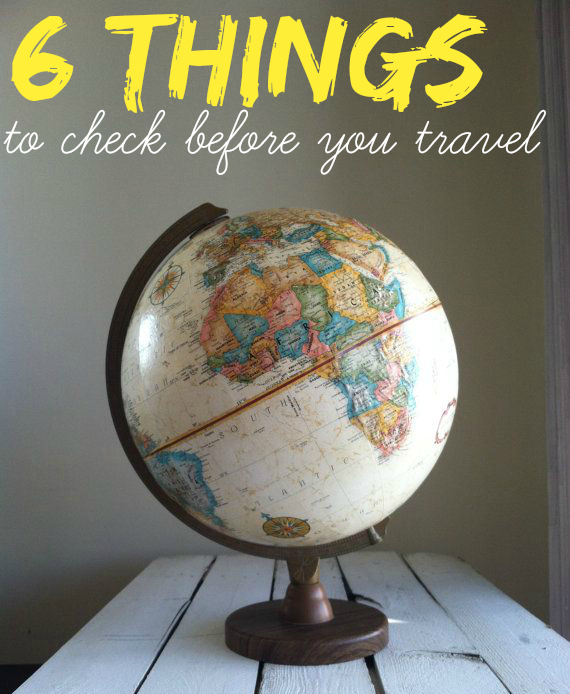 I also save all the interesting blog articles about travel places I want to see during the year in my favourites of my firefox, so I always have a back up with tips to every location. Often airlines are providing an online check in for the flight e.g. 24 hours before. It's not only more relaxed if you can skip the check in at the airport but also you have a save seating place and don't have to worry if the flight is overbooked. I usually use the passbook app for flight tickets, which works perfectly at the boarding and for safety (shock moment at the airport if you're phone isn't charged) I send myself a mail with the tickets as pdf. How's the weather forecast? Which basics suit to many looks and which eyecatcher items like a leather jacket do I want to take with me? Best way to plan your looks is to make some flatlay with possible outfits. What items are provided by the hotel - hair dryer, towels,...? What do I have to pack in my carry-on luggage? My mother always told "have a bikini and a outfit for change in your hand luggage" and yes you have to (My suitcase arrived 2 days later some years ago when I went to a summer vacation - it would have been very annoying if I had not the possibility to enjoy at least the pool for two day). Do I have all the electronics and their chargers with me? Does the country have other electronic outlets and do I have an adapter? Have carry-on luggage restrictions in mind and put your needed cosmetics and fresh ups for the flight in the transparent bags. Der Zara Cardigan, den man ja wirklich auf vielen Blogs schon beobachten konnte, erinnert mich vom Muster und Stil her total an Isabel Marant. Isabel Marant steht für mich für groben Strick, oversized, Fransen (wie z.B. bei den Isabel Marant pour HM-Boots, die Verena immer wieder gekonnt auf ihrem Blog zeigt) und vorallem geometrische Muster - gut zu sehen in dem wahnsinnig schön dargestellten Lookbook und Catwalk der Isabel Marant Winterkollektion. Da ich den Isabel Marant-Stil momentan leicht hype, MUSSTE ich diesen Cardigan einfach haben. Und toller Nebeneffekt: Er passt super zu meiner bordeauxroten Mini Mac und hält mega warm! This zara cardigan can already be seen on many blogs and with its print and style it reminds me totally of Isabel Marant. The style of Isabel Marant is for me thick knit, oversized, fringes and of course geometrical prints (like it all can be seen on this lovely piece of knit or in the absolut lovely winter lookbook and catwalk of the Isabel Marant collection). Because I kind of hype the Isabel Marant style at the moment, I HAD to buy this cardigan. And I HAVE to tell you as well the story behind it: I missed to buy this lovely item during the season at Zara so I was hoping all the months for the sale time. Directly at midnight, every person must have thought "Now she's gone crazy", because I scrolled as fast as I can through the knit section online at Zara and finally found it. The happiness was huge, but was killed some minutes later. While the paying process, my mac decided to start an update and when I managed to find the cardigan in the Zara shopping app on iPhone, it was already sold out. Until new years eve in Hamburg, I cancelled all the dreams about the cardigan, but when I walked just for fun into the local zara there, I saw a girl that was giving back her online order at the cash desk...and THE cardigan was in it! Of course I was the happiest girl ever and walked proud with my Zara bag outside! I love these moments of luck, when you don't except them! Pinterest hat mich an diesen grauen tristen Tagen mal wieder zum Schwärmen gebracht. Als ich die Worte "walk in closet" in das Suchfeld tippte und vor mir ein Traumkleiderschrank nach dem Nächsten erschien, setzte sich der Gedanke: "Joana du BRAUCHST einen begehbaren Kleiderschrank" in meinem Kopf fest. Da das momentan platztechnisch in der Wohnung nicht möglich ist, bleibt es erstmal ein Traum auf meiner Interior-Pinnwand, mit dem ich euch auch den Tag versüßen möchte - denn welche Frau wünscht sich kein begehbaren Kleiderschrank? Ich bin gespannt wie euch meine Ideen gefallen. Wie ist denn euer Kleiderschranksystem? Ich bin definitiv ein "Hängemensch" - bei mir muss wirklich alles auf Bügeln hängen und nur wenige Sachen kommen bei mir in Schubladen. 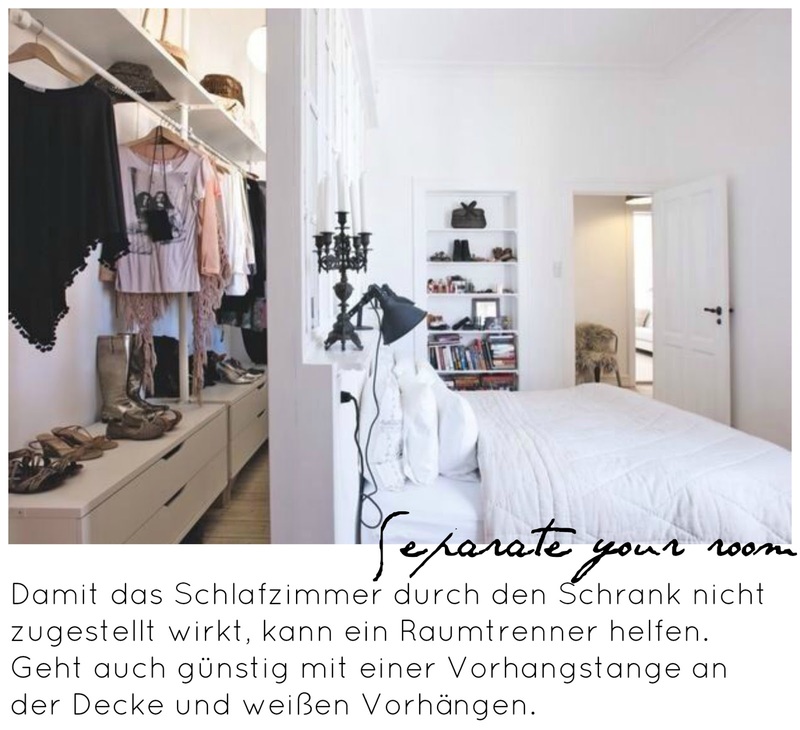 Wenn ihr möchtet, zeige ich auch mal eine kleine Roomtour, wie mein momentaner Kleiderschrank aussieht! Pinterest is like a drug: as soon as I typed the words 'walk in closet' into the search mask, the idea of a walk in closet won't leave my head. 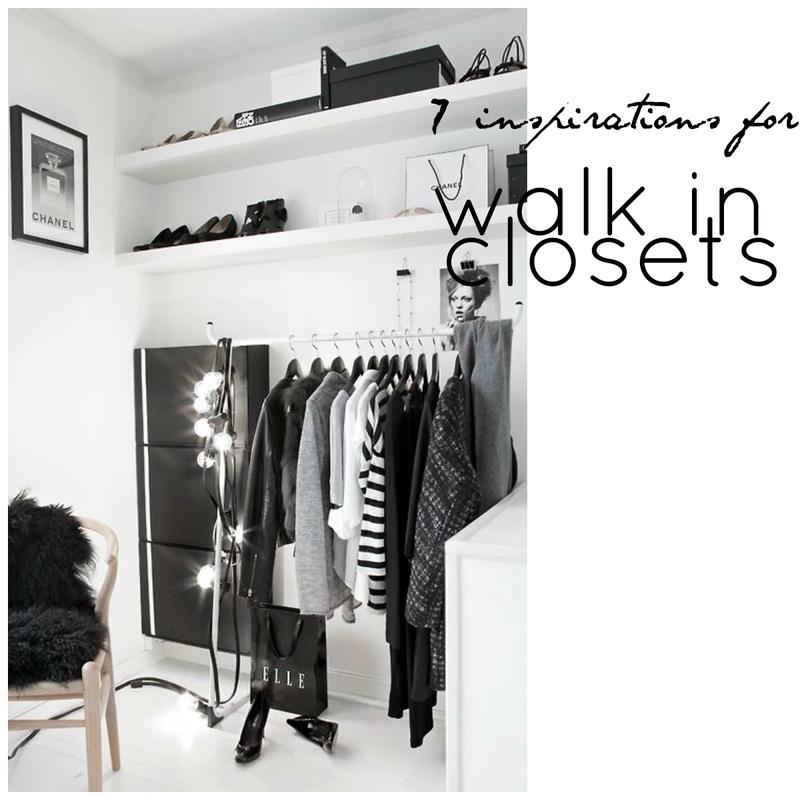 Unfortunately I haven't enough space for a walk in closet in my current appartement, but nevertheless I want to share my walk in closet ideas and 7 inspirational pinterest pictures with you. 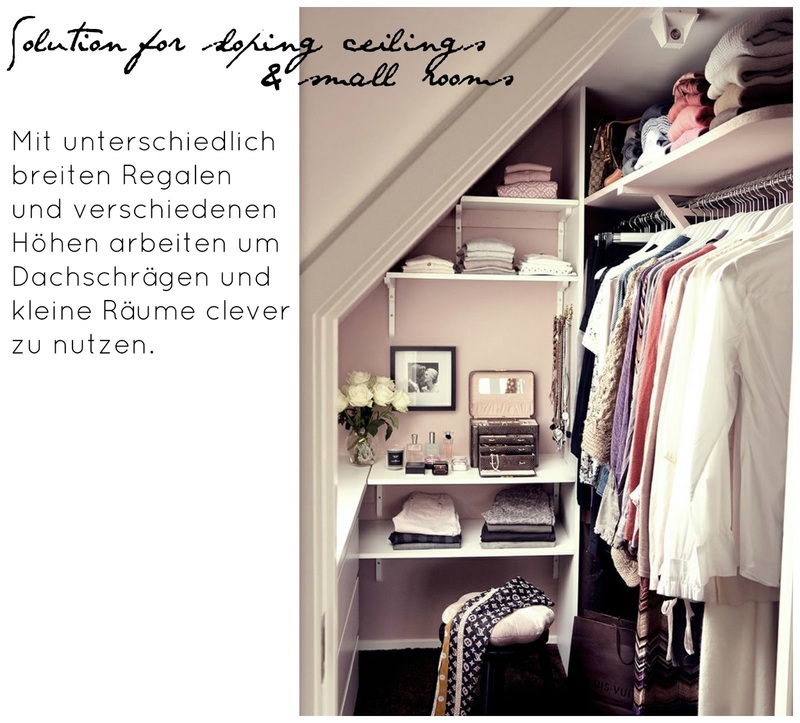 Especially for apartments with sloping ceilings or small unused rooms, a walk in closet seems perfect, because you can adjust the size and height of your shelves directly to your needs. 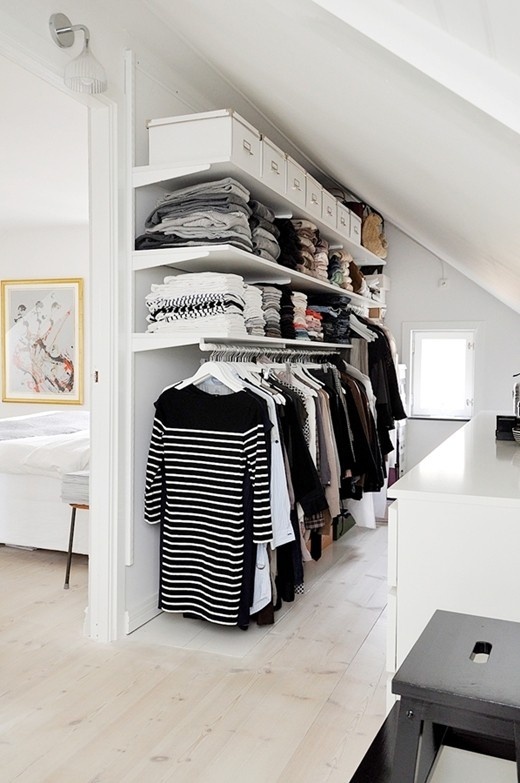 Let me know, how you like my walk in closet inspiration and if you already call a walk in dream yours? Einen leicht rockig angehauchten Look könnte ich wirklich andauernd tragen. Für mich gibt es nichts Zeitloseres, wie die Kombination von Jeans, Lederjacke, simplen Shirt, Crossbody Bag und einer Pilotenbrille. Die Heels dazu geben dem ganzen Outfit dann noch ein leicht chicen femininen Touch. Die verspiegelte Aviator Sonnenbrille von SXUC habe ich bei Sunglasses Shop gefunden und sie ist im Vergleich zu meiner blau verspiegelten Ray Ban nicht nur ein günstigeres Aviator Modell, welches beinahe gleich aussieht, sondern auch wesentlich schlichter, da sie nur silber verspiegelt ist. Definitiv ein zeitloser Klassiker, der in meiner Sonnenbrillen-Sammlung bisher noch gefehlt hat. Unter der Rubrik Pilotenbrillen hätte ich mich bei Sunglasses Shop direkt austoben können, da es wirklich meine liebste Sonnenbrillenform mittlerweile geworden ist. Ich kann es kaum erwarten euch in einem Monat schöne Urlaubsbilder aus Ägypten mit ihr zu zeigen! Was ist denn eure liebste Sonnenbrillen Form? Und wie gefällt euch der simple Alltagslook? I could wear these looks with a biker chic touch every day. There's nothing more simple than an outfit with jeans, leather jacket, basic shirt, crossbody bag and some aviator sunglasses. The heels give the outfit a more feminine touch. I found the mirrored aviator shades by SXUC via sunglasses shop and compared to my blue mirrored ray ban it's not only a cheaper model but with the silver mirrored glasses also a more timeless one. I can't wait to show you some vacation pictures of egypt in one month with it! Beinahe so schön wie Weihnachten ist für mich die anschließende Sale Saison in jedem Geschäft. Vorallem wenn man so wie ich die komplette Herbst-Winter-Saison aufgrund des Studentenbudgets großes Shoppen vermieden hat, locken die roten Schildchen in den Schaufenstern von Zara, Mango und Co natürlich. Gerade vor ein paar Stunden habe ich begonnen online im Mango Sale zu stöbern und habe ein paar tolle Teile gefunden, die ich euch natürlich zeigen möchte. Momentan liebe ich diesen monochromen cleanen Stil und die Kombination verschiedener Schwarz-Weiß Elemente. Deshalb hat auch eine oversize Bluse in weiß und ein schickes s/w gemustertes Kleid den Weg in mein Online Warenkorb gefunden. Die Bluse stelle ich mir vorallem toll vor in Kombination unter Strickpullovern oder bedruckten Sweatern. Wie gefallen euch die Teile und habt ihr schon im Sale zugeschlagen? Nearly as beautiful as christmas is the sale season afterwards. Especially if you are student and saving money the whole season, the red sale sign in front of every store attract you a lot. 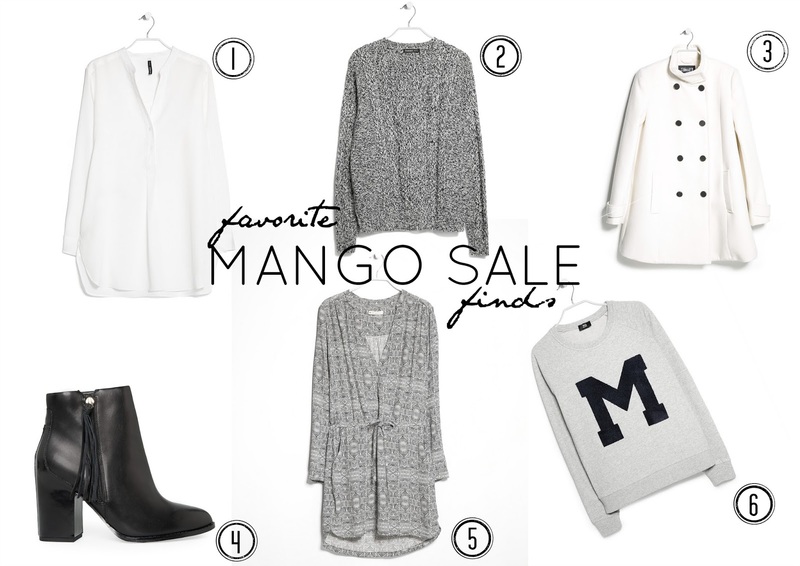 Some hours ago I began to check out some mango sale items online and of course I want to show you my favourites. Nowadays I love these monochrome clean style and looks in black and white and as a result there my wishlist is filled with these "colours". Do you like the items and have you already made some great sale finds? Eigentlich mache ich mich selbst immer zum Spaß bei Freundinnen über diese ganzen Mainstream Outfits lustig; wenn irgendetwas "sowas von hipster yolo swag" aussieht. Hipster wurde bei mir mittlerweile als Wort für alle Mainstream-Kleidung, die momentan so wirklich jeder zweite auf der Straße trägt, etabliert: Komisch bedruckte Mützen mit Sprüchen wie "I'm not a blogger", "SWAG" oder als fortgeschrittene Version die Kombination einer solchen Mütze mit Airmax, Strumpfhose, High-Waist-Jeansshorts und einem "Tartan"-Hemd. Neuester Hipster Trend: Lila farbener Lippenstift. Anfangs wurden von mir die ganzen Instagram Selfies mit lila Lippen - natürlich Heroin von Mac - noch belächelt. Bis ich dann von AVON zufälligerweise ein lilanen Lippenstift in den Händen hatte und er mir wirklich an mir gefiel. Als ich dann zu den lila Lippen mein geliebtes Karohemd von Sassyclassy trug, kam von sämtlichen Männern in meinem Freundeskreis nur noch: "Joana ist jetzt auf die Hipsterseite des Lebens übergewandert." Aber da mir die Kombination mit den schicken Chelsea Boots super gefällt, wollte ich euch meinen "Hipster" Look natürlich nicht vorenthalten. Was ist für euch DAS typische Mainstream-Kleidungsstück? Und wie gefällt euch der Look? PS: Super amüsant zu dem Thema Mainstream Blogger Teile fand ich diesen Post von Lena. Usually I'm making fun of these typical hipster mainstream looks, e.g. caps with weirdo prints like "SWAG" or "I'm not a blogger" together with airmax and jeans shorts. The newest hipster trend according to my instagram stream is purple lipstick (especially MAC Heroin) and while I was smiling on these hipster selfies, I tried a purple lipstick and began to love it. Some days ago I wore it together with a plaid shirt and everyone of my friends just smiled and said "oh kind of hipster isn't it?". But I (unusually) love this combo of typical hipster items together with the chic chelsea boots. What do you think about it? Tief in jedem von uns ist doch ein Gewohnheitstier verborgen. In der Liebe lassen wir uns doch irgendwie immer vom selben Typ anziehen. Und auch in der Mode kommt bei mir dieses kleine Tierchen immer mal wieder zum Vorschein: Zwar wollen wir Modeblogger und Modebewusste ständig neue aufregende Kombinationen aus dem Kleiderschrank hervorzaubern, aber irgendwie bleiben wir doch immer bei unseren Lieblingsteilen hängen. Aber ist das nicht gerade das Tolle an Mode? Ein liebstes Teil in unzähligen Kombinationen kombinieren, damit wir uns nie an unserem Lieblingsstück satt sehen? Den camelfarbenen Mantel könnt ich sicherlich schon bald nicht mehr sehen (hier, hier, hier, hier, hier) aber heute gibt es ihn einmal in einem casual angehauchten Uni Look. Er hat sich vorallem während des Herbstes durch seine neutrale Farbe wirklich zu einem Lieblingsteil entwickelt. Und ausnahmsweise seht ihr mich auch mal wieder mit Brille - ohne diese würde in der Uni nämlich gar nichts laufen. In meinem Herzen ist der Frühling schon eingezogen, deswegen greife ich schon gerne zu knalligen Highlights im Outfit - wie diesem Zara Volant Top, welches ich im Sale ergattert habe. Habt auch ihr ein Lieblingsteil, welches ihr in unzähligen Varianten kombiniert und wie gefällt euch der Look? Doesn't has everyone of us some habits that we can't resist from? It doesn't matter if I talk about love or fashion - there are always some special things that attract us. Fashionbloggers and -lovers want to show you day after day different interesting combinations out of their wardrobe, but the truth is that we pick always some out of the same small amount of beloved clothes. But isn't this the greatest aspect concerning fashion? To combine one beloved item in uncountable ways that we never get enough of it? The camel coat was already shown to you many times on the blog (here, here, here, here, here) but today you can see it in an university look with a casual touch. With its neutral colour, it became one of the most worn pieces of my wardrobe during last autumn. Spring has already arrived in my heart and so I love to wear some bright colours like my newest zara sale find. What's your most beloved item, which you combine in uncountable ways? In letzter Zeit esse ich unglaublich gerne indisch. Genauer gesagt begann diese Liebe, als ich vor ziemlich genau das erste Mal in London richtig gut indisch essen war. Und genau seit dort habe ich auch niemals wieder einen richtig guten Inder gefunden, deshalb habe ich beschlossen, mich selbst mal an einem saisonalen Curry zu versuchen. Die Menge der Zutaten klingt vielleicht zuerst abschreckend, aber die Zubereitung ist schritt für schritt wirklich machbar und das Ergebnis dafür unglaublich lecker. Dazu ist das Ganze sogar noch vegan und auch ein Fleischesser wie ich kommt voll auf seine Kosten. Die grüne Currypaste aus der Internationale Spezialitäten Abteilung im REWE kann ich euch übrigens wirklich empfehlen - dadurch kann man super einfach diese typische indische Schärfe in seine Gerichte bekommen. Das Öl in einer großen tiefen Pfanne erhitzen und Zwiebeln und Knoblauch darin bei schwacher Hitze anbraten, bis sie weich sind und eine leichte Farbe haben. Währenddessen den Kürbis in kleine Würfel schneiden. Sobald die Zwiebeln durch sind, die Curry Paste (Menge gemäß Verpackung und Schärfewunsch) hinzufügen und unter ständigem Rühren kurz kochen. Anschließend Kürbis, Kichererbsen, Kokosnussmilch, Wasser und eine Prise Salz hinzufügen, zum Kochen bringen und bei niedriger Hitze zugedeckt für 35-40 Min kochen lassen, manchmal umrühren. Währenddessen den Reis gemäß Packungsanweisung kochen. Der Kürbis sollte durch aber gabelfest sein und das Curry leicht dickflüssig. Falls es zu flüssig ist, einfach offen die Flüssigkeit ein paar Minuten rauskochen lassen. Anschließend Erbsen und Spinat hinzufügen und mit Basmatireis servieren. Heat the oil in a large and deep pan and cook at a low heat the chopped onions and garlic until they're light coloured. Dice your pumpkin into small squares. As soon as the onions are cooked, add curry paste and cook the mixture and keep stirring. Afterwards add your pumpkin, chickpeas, coconut milk, water and some salt, boil it and let it simmer covered at a low heat for 35-40 mins (stir sometimes). Make the rice according to the instructions. The consistency of the curry should be thick, so let it cook down opened some minutes if its too liquid. Then add peas and spinach and enjoy with rice.